2. the trapping of a liquid or gas within cavities in a solid or on its surface. 3. the relation of the teeth of both jaws when in functional contact during activity of the mandible. 4. momentary complete closure of some area in the vocal tract, causing breathing to stop and pressure to accumulate. Normal occlusion of the primary molars. From Darby and Walsh, 1994.
central occlusion (centric occlusion) occlusion of the teeth when the mandible is in centric relation to the maxilla, with full occlusal surface contact of the upper and lower teeth in habitual occlusion. coronary occlusion see coronary occlusion. eccentric occlusion occlusion of the teeth when the lower jaw has moved from the centric position. functional occlusion contact of the maxillary and mandibular teeth that provides the highest efficiency in the centric position and during all exclusive movements of the jaw that are essential to mastication without producing trauma. (ŏ-klū'zhŭn), Do not confuse this word with atresia or stenosis. 1. The act of closing or the state of being closed. 2. In chemistry, the absorption of a gas by a metal or the inclusion of one substance within another (as in a gelatinous precipitate). 3. Any contact between the incising or masticating surfaces of the upper and lower teeth. 4. The relationship between the occlusal surfaces of the maxillary and mandibular teeth when they are in contact. 4. momentary complete closure of some area in the vocal tract, causing the breath to stop and pressure to accumulate. balanced occlusion occlusion in which the teeth are in harmonious working relation. centric occlusion that in the vertical and horizontal position of the mandible in which the cusps of the mandibular and maxillary teeth interdigitate maximally. 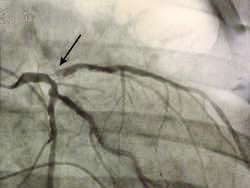 coronary occlusion complete obstruction of an artery of the heart. habitual occlusion the consistent relationship of the teeth in the maxilla to those of the mandible when the teeth in both jaws are brought into maximum contact. lateral occlusion occlusion of the teeth when the lower jaw is moved to the right or left of centric occlusion. lingual occlusion malocclusion in which the tooth is lingual to the line of the normal dental arch. mesial occlusion the position of a lower tooth when it is mesial to its opposite number in the maxilla. normal occlusion the contact of the upper and lower teeth in the centric relationship. venous occlusion the blocking of venous return. a. The process of occluding. 2. Medicine An obstruction of an anatomical passage, as of an artery by plaque. 3. Dentistry The alignment of the teeth of the upper and lower jaws when brought together. 1 (in anatomy) a blockage in a canal, vessel, or passage of the body; the state of being closed. 2 (in dentistry) any contact between the incising or masticating surfaces of the maxillary and mandibular teeth. occlude, v., occlusive, adj. Closure of the upper and lower molars. The complete closure of an orifice. The covering of one eye, either totally or partially, to prevent or reduce visual stimulation. 1. The complete closure of a vessel with gas, liquid or solid. 3. Closure of the upper and lower molars. See Acute vascular occlusion, Aortic occlusion, Central retinal artery occlusion, Malocclusion. 3. The covering of an eye in order to improve vision in the other, e.g., in treating strabismus. In dentistry, an occlusion in which the posterior teeth of a denture have masticatory surfaces that resemble natural, healthy dentition and articulate with the surfaces of similar or opposing teeth. The opposing teeth may be artificial or natural. A blockage of blood flow through an artery. It may be acute or chronic and occurs, for example, in coronary or in peripheral arteries. Patients with acute arterial occlusion have severe pain (as in angina pectoris), decreased or absent pulses, and mottling of the skin of an affected extremity. The occlusion is removed and blood flow restored if possible. Blockage of blood flow to the retina (that is, to the central retinal artery or one of its branches), resulting in sudden visual loss. The condition usually affects one eye. When the retinal artery is blocked by a blood clot, early thrombolysis sometimes provides sight-preserving therapy. CRAO is typically caused by a tiny embolus that lodges in the retinal circulation. It usually occurs in people with high blood pressure, diabetes mellitus, cardiac valve disease, or atrial fibrillation, which predispose to atherosclerosis or arterial embolization. Other causes include inflammatory or autoimmune diseases affecting the circulation (arteritis), clotting disorders, hyperlipidemia, injected drugs or contaminants, and tumor metastases. Any dental occlusion other than centric. The usual relationship between the teeth of the maxilla and mandible that represents the maximum contact. This occlusion varies from person to person and is seldom ideal or true centric occlusion. In the eye, a pupil with an opaque membrane shutting off the pupillary area. Injury to the tissues that support the teeth because of malocclusion, missing teeth, improper chewing habits, or a pathological condition that causes a person to chew abnormally. The usual method of contact of teeth as the mandible is moved to one side during chewing. 1. Closing off or covering of an opening, or obstruction to a hollow part. 2. The relationship of the biting surfaces of the teeth of the upper and lower jaws. 3. The deliberately covering of one eye for periods of weeks or months in the treatment of AMBLYOPIA in children. The way upper and lower teeth fit together during biting and chewing. The act of blocking or the state of being blocked. Examples: vision with an occluder, a vessel with an embolus. occlusion amblyopia See amblyopia; occlusion treatment. o nystagmus See occlusion nystagmus. punctal occlusion Sealing of the lacrimal punctum, temporarily (e.g. with a plastic plug) or permanently (e.g. by heat cauterization), to preserve the natural tears or prolong the effect of artificial tears. This method is commonly used in the management of keratoconjunctivitis sicca. Occasionally a plug made of collagen is used prior to insertion of a more permanent type of punctal plug, because it dissolves within a week. This is done to determine whether permanent or semi-permanent occlusion (as with a silicone plug) is likely to succeed. See neurotrophic keratopathy. retinal arterial occlusion See retinal arterial occlusion. retinal vein occlusion See retinal vein occlusion. occlusion test See cover test. occlusion treatment A method of treating amblyopia or strabismus by covering the good eye. Such a method is most effective below the age of four years and with little effect after the age of nine years, that is beyond the critical period of development. However, this technique must be used with caution as prolonged occlusion in very young children can lead to a reversal of eye dominance in which the previously good eye becomes amblyopic (called occlusion amblyopia). Moreover, it has been shown that the effect of occlusion does not improve beyond six hours at a time. Alternate occlusion is preferred as both eyes are thus stimulated. Syn. patching See form-deprivation myopia; penalization; critical period; pleoptics. 2. Any contact between the incising or masticating surfaces of upper and lower teeth. 3. Relationship between occlusal surfaces of maxillary and mandibular teeth when in contact. n 1. the act of closure or state of being closed. n 2. a contact between the incising or masticating surfaces of the maxillary and mandibular teeth. n the ideal relation of the mandibular and maxillary teeth when closed. n.pl the characteristics of the anterior teeth, i.e., occlusion, alignment, overlaps, and capacity to disclude conjointly with the trajectories given the condyles, that determine the cusp elevations and the fossa depressions of the postcanine teeth. n an occlusion in which each tooth of the dentition wears occlusally and proximally as it erupts. n 1. an occlusion of the teeth that presents a harmonious relation of the occluding surfaces in centric and eccentric positions within the functional range of mandibular positions and tooth size. n 2. the simultaneous contacting of the maxillary and mandibular teeth on both sides and in the anterior and posterior occlusal areas of the jaws. This occlusion is developed to prevent a tipping or rotating of the denture base in relation to the supporting structures. This term is used primarily in connection with the oral cavity, but it may be used in relation to teeth on an articulator. n the closure suitable for worn dentitions that are cuspless or have flat-sided cusps; it permits an increase of the amount of surface contact in centric closure and provides as much closure contact as possible for horizontal chewing. This kind of occlusion is a therapeutic form designed to keep dentures seated when fine-textured foods are chewed horizontally. It is not found in young, unworn natural dentitions. n the lateral mandibular movements guided by the canine teeth. n a centrically related centric occlusion in which the teeth close with even pressures on both sides of the oral cavity but have no occlusion of the postcanine teeth in attempted eccentric closures. n.pl the various factors involved in occlusion (e.g., temporomandibular joint, associated neuromusculature, and teeth). In denture prosthetics, also the denture-supporting structures. n a coronary thrombosis resulting in closure of the coronary artery. See also thrombosis, coronary. n an occlusion in which the mandibular teeth overlap the maxillary teeth. n.pl the classifiable factors in the gnathic organ that influence occlusion. These factors are divided into two groups: those that are fixed and those that can be modified by reshaping or repositioning the teeth. The fixed factors most mentioned are the intercondylar distance; anatomy, which influences the paths of the mandibular axes; mandibular centricity; and the mating of the jaws. The changeable factors most mentioned are tooth shape, tooth position, vertical dimension, height of cusps, and depth of fossae. n any occlusion other than centric occlusion. n an occlusion in which the anterior teeth of both jaws meet along their incisal edges when the teeth are in centric occlusion. n a condition in which centric occlusion does not correspond to a patient's centric jaw relationship, resulting in premature or interceptive or deflective tooth contacts in the centric path of closure. n 1. an occlusion in which attention is directed specifically to performance and is differentiated from structure and appearance. n 2. any tooth contacts made within the functional range (according to the size) of the opposing tooth surfaces. An occlusion that occurs during function. n used in the sense of designating contacts of teeth in motion. A substitute for the term articulation. n 1. the relationship existing when all the teeth are perfectly placed in the arches of jaws and have a normal anatomic relationship to each other. When the teeth are brought into contact, the cusp-fossa relationship is considered the most perfect anatomic relationship that can be attained. n 2. the normal relationships of the inclines of the cusps of opposing teeth to each other in occlusion, when the alignment, proximal contacts, and axial positions of the teeth in both arches have resulted from normal growth and development in relation to all associated tissues and parts of the head. n right or left lateral movement of the mandible until the canines on the respective sides are in a cusp-to-cusp relationship. See also cross-bite. n an occlusal relationship of such nature that lateral and protrusive mandibular movements are limited. n a disturbance in the normal or proper action of the masticatory apparatus produced by such factors as missing teeth or tilting and drifting of teeth. n an occlusion balanced without reference to physiologic considerations (e.g., on an articulator). n an occlusal relationship capable of producing pathologic changes in the teeth, supporting tissues, and/or other components of the stomatognathic system. n an occlusion in harmony with functions of the masticatory system and presents no pathologic manifestation in the supporting structures of the teeth; the stresses placed on the teeth are dissipated normally, with a balance existing between the stresses and adaptive capacity of the supporting tissues. n a balanced occlusion in harmony with the temporomandibular joints and the neuromuscular system. See also occlusion, balanced. n an occlusion of the teeth existing when the mandible is protruded forward from a centric position. See also position, rest, physiologic. n an arrangement of teeth that places their occlusal surfaces on the surface of an imaginary sphere (usually 8 inches [20 cm] in diameter) with its center above the level of the teeth, as suggested by Monson. n the relation of opposing occlusal surfaces that provides the maximum natural or planned contact and/or intercuspation. n an occlusion that results in overstrain and injury to teeth, periodontal tissues, or the residual ridge or other oral structures. n the occlusal contacts of teeth on the side toward which the mandible is moved. From the mesial or distal view, the buccal and lingual cusps of the maxillary teeth appear to be end-to-end with the buccal and lingual cusps of the lower teeth, respectively. Viewed from the lateral, each maxillary cusp is distal to the corresponding lower cusp. The mesial incline of each maxillary cusp makes contact with the distal incline of the opposing cusp in front of it, and the distal incline of each upper cusp makes contact with the mesial incline of the opposing cusp distal to it. 1. the act of closure or state of being closed; an obstruction or a closing off. 2. the relation of the teeth of both jaws when in functional contact during activity of the mandible. contact of the maxillary and mandibular teeth that provides the highest efficiency in the centric position and during all exclusive movements of the jaw that are essential to mastication without producing trauma. a technique used in cardiac surgery to produce complete circulatory arrest by temporarily interrupting venous return. any abnormality of occlusion which causes injury to structures within the mouth.